Alberto here. 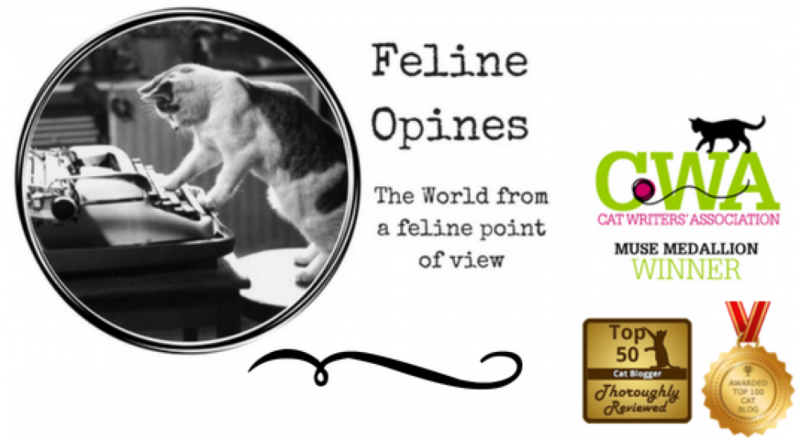 It’s my weekly wander through the web to find you the best of feline stories. Felines (and I guess other animals too) rejoice because today is National Pet Day! Those clever humans at Airbnb are featuring places that have feline hosts. The photo above is of host Kooky with his human Sue (they are in London). But you don’t have to fly across the pond for a feline flavored stay. Chica and her human share a nice bungalow in Portland. But there are many other feline hosts in other countries as well. I’m thinkin’ our Humans should check this out when they travel, a nice room and all the purrs & head bonks they want! This story hits all the right buttons, the Female Human loves bookstores (that’s because she’s a writer) and I love stories about working cats. There have always been felines at the Twice Sold Tales book store. The author of this article says in their visits over the years there have been as many as seven felines and as few as two working in the store. The current cats are Buster, Hardy, Lily and Eleanore. What I didn’t know is that bookstore cats come from a very old tradition. Bookstore cats, simply put, exist to keep the threat of bookstore rats at bay and the practice has been in use since 1745 when Empress Elizabeth of Russia issued an edict that there be a search conducted for the “best and biggest cats, capable of catching mice” and ordered them sent to the Hermitage in St. Petersburg to protect the treasures there. Ever since then bookstores have welcomed working felines into their midst. The article is delightful and I really enjoyed the descriptions of each feline. Does your local bookstore have a cat? I must send the Female Human out to ours to check! My furiends, if your humans are planning a vacation, please make sure they know about this place. it’s a popular tourist town called Houtong and it has over 100 feline residents. Houtong means “monkey cave” and is in northern Taiwan. It was first famous for it’s caves filled with monkeys. No one can say exactly what happened to the monkeys, but the town is not without furry citizens. As soon as you step off the train, you are met by felines of varying varieties. You find your way through the station by following the cat paw prints. As you can imagine, since felines rule, most everything in the town is cat-themed. Bakeries offer cat-shaped cookies, there are cat souvenirs and of course plenty of felines to snap a selfie with. And of course, there are houses built for the cats, and decorated to please the most finicky feline. Meowza this sounds like a purrrfect vacation spot. Book your human’s tickets posthaste! First, allow me to say that this title has me a bit nervous. You see all of the Tribe are rescues so we aren’t officially a “breed” but the Female Human said that all cats are some sort of breed and humans often gravitate to one type of breed, even when they’re adopting. For our Humans, it’s Siamese. All of the Tribe have some bit of Siamese in us and The Female Human says it’s because we are so smart, we talk a lot and they just love the way we look. Even though my brother Oliver doesn’t look anything like a Siamese, he still has the purrsonality traits. You can image my surprise and dismay when Siamese was never mentioned in this article! Elite, I hiss in your general direction! I know how much you humans love to play games and you humans know how much we felines like to get right in the middle (and often on top of the board) of any game you’re playing. Well here’s a game that’s purrfect for feline and human! In the game, you can buy your favorite cats (not to self, have the Human check and make sure the Siamese are represented!). Roll the dice and you may land on catnip which means everything in the middle of the board is yours. Collect litter boxes and trade them for fish bones (instead of hotels). There are some dangers though. If you run into the neighborhood bully you may be forced to pay the dog tax (hiss!) and, if you fall in the water you lose three turns. Meowza this sounds like fun!